While unfortunately, I can’t include the latest Twilight, Nic Cage’s most recent debacle Trespass, or the Adam Sandler slip-up Jack and Jill because I didn’t bother seeing any one of those, there were five shining, terrible gems that worked hard to make this list. Two movies tie for this spot because while both had their entertaining moments, both were pretty bad. Abduction had as many laughable moments as the second Hangover, while Taylor Lautner tried far too hard to be a young Jason Bourne. I will admit that some of the fight sequences were impressive on Lautner’s end, but between the over-dramatic dialogue and failed attempt to issue a sort of suspense that wasn’t quickly followed by a laugh, the script, Lautner, and the poorly used supporting cast made this movie all the more a mess and even painful to watch at times. The Hangover Pt. 2 reigns as the biggest disappointment for a sequel for me. Director Todd Philips took the formula that made the original a great hit and decided to repeat it action for action rather than employ any form of originality in this movie. For having such a hilarious leading cast under his belt, Philips really blew this great opportunity to make a hilarious sequel. Bad Teacher was just a bad movie. It’s a great example of how to bring movie-goers in on opening weekend, and then allow bad word-of-mouth to drive any other potential viewers away. From the looks of the trailer, Jason Segel, Justin Timberlake, and Cameron Diaz were going to make us crack up throughout the movie. I can’t recall laughing one time the entire movie. Every one of Segel’s few scenes were shown in the trailer, leaving no possibility of surprise or laughs. Diaz played an entirely unlikable character that never felt like bringing you over to her side the entirety of the movie. I'm as scared as Shia in this picture. This was the movie I wasted the most money on in 2011. 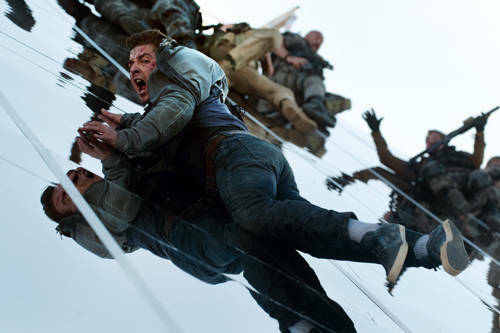 Michael Bay successfully made one of the worst movies of the year without batting an eye. Shia Labeouf must have been coming off his latest run-in with the police or argument with a random bar-hopper, because his bad attitude was the only visible emotion he displayed on screen throughout the long, laborious three hour-length movie–1 1/2 hours too long. Then, in steps Rosie Huntington-Whiteley, the Victoria’s Secret model that has never acted before, and lets us know within five minutes that that‘s the case. I had to even laugh at Bay’s attempt at jabbing Megan Fox with a line from one of the characters that was something like, “I HATED your old girlfriend. She’s so *insert negative remark here*. Scene after scene of unexplained phenomena continued while I stepped out of the theater to get a break from the madness and go to the bathroom. Luckily, the movie theater’s credit card machines were down and I was able to see this movie for free, because only my time was wasted in this case. Perhaps some of the failure of this movie is due to it not finding it’s direction under Marvel, which has made many successful action/superhero movies. Seth Rogen blows in this movie more than other flops he has turned in year after year. Christopher Waltz fills the role of the worst villain I have ever seen in a movie. I have no clue what Cameron Diaz was doing in this movie, because she didn’t fit at all, and the bromanship between Rogen and Jay Chou quickly plummeted as they both attempted to over-induce the audience with their version of being dramatic. James Franco made an odd, but interesting cameo in the beginning, and he is the luckiest of them all because he got killed off so early. I wish Rogen and Chou would have followed in his footsteps, or better yet, not made this horrible movie. Beastly holds the number spot for worst movie I saw in 2011, because I couldn’t think of any other movie that was as bad as this one. There are so many problems with this movie, I don’t even know where to begin. Writer-director Daniel Barnz wrote one of the worst screenplays to make it on the big screen. It has to be the poorest attempt at taking a story/movie gem like Beauty and the Beast and trying to make a spiff off it. While Vanessa Hudgens could be a believable Beauty, every last one of her lines were oozing with sap, refusing to let her portray a normal, actual person who talks like a normal, actual person. Alex Pettyfer plays the “beast” character, that instead of losing his six-pack, gains a new set of tattoos and goes bald. “Pretty gruesome,” his character refers to his new look, but Hudgens declares that she’s seen worse, and now we all know that somehow in this pile of sloppy, self-indulgent, pretentious script, Beauty will wind up with the Beast. Which leads me to question many of the movie’s plotholes: Why would her father allow a complete stranger to hole her up in a house? Why does Pettyfer think gifts such as a designer purse or wearing a mask will “woo” a girl downstairs? Which leads me to the biggest question of sorts, why did I sit through this entire movie? Or even more so, how did I not vomit throughout the movie? What were the worst movies you saw in 2011? Did you like any of the ones that I couldn’t stand, or would you put them on your worst list too?